His Highness Sheikh Ahmed bin Mohammed bin Rashid Al Maktoum, Chairman of the Mohammed bin Rashid Al Maktoum foundation, inaugurated the activities of the Islamic Economic Fiqh Forum yesterday. In context of His Highness Sheikh Mohammed bin Rashid Al Maktoum, Vice President State, Prime Minister and Ruler of Dubai’s quote, “Dubai is the capital of Islamic Economies in the world”, therefore, the Forum will aim to foster the development of Islamic economics. Under the patronage of His Highness Sheikh Hamdan bin Mohammed bin Rashid Al Maktoum, Crown Prince of Dubai, Chairman of the Executive Council of the Emirate of Dubai, the Forum will take place at the Department of Islamic Affairs and Charitable Activities in Dubai, in collaboration with the Dubai Centre. Earlier today, the Forum began with the national anthem followed by recitation of verses from the Quran. A documentary about Dubai’s experience in various fields as well as the story of its success from a mere desert to an oasis of innovation was showcased. The film also highlighted the city’s key characteristics of diversity. With over 200 nationalities inhabiting the city, the film also exhibited strong infrastructure, economic dynamism and flexibility of legislation, and regulations of Dubai. The video shed light on the forum’s ambition through prominent pillars namely, finance, halal sector, family tourism, digital infrastructure, designs, knowledge and standards. Director General of the Department of Islamic Affairs and Charitable Activities Department, member of Council for Islamic Economics Centre Dubai, Chairman of the Organizing Committee of the forum, HE Dr Hamad Al Shaibani highlighted the forum’s importance as a stepping-stone towards the establishment of a global reference. In his speech, he emphasized the standards of Islamic economics and pointed out that the presence of prestigious scholars from the Islamic law and economy makes the forum the most prominent of all, and puts it on the map of leading economies. Based on strong foundations of Share’a, the forum is set to become a leader of the Islamic thought and jurisprudence. 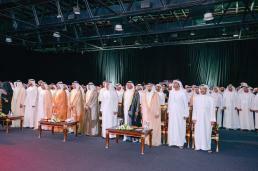 President of The Forum for Promoting Peace in Muslim Societies, Shaikh Abdullah bin Bayyah, also delivered his speech. His reputation as one of the world’s pre-eminent Islamic scholars, with enormous influence over Muslim scholars, and intellectuals from various denominations, marked the Forum’s importance. He confirmed that the relationship between peace and the economy is intimate. He stressed that the leaders of this country are aware of the dimensions of their key responsibilities; without their security and the blessings of God, we wouldn’t have witnessed so much prosperity. Abdullah Mohammed Al Awar, CEO, Dubai Islamic Economy Development Centre, said, “One of the key strategic objectives of DIEDC is to encourage research and studies related to Islamic economy jurisprudence and ensure the legitimacy of its provisions in Islamic banking transactions and products. The forum will serve as prominent milestone in marking the progress and evolution of Dubai as a capital of Islamic economy. The forum honored the sponsors and strategic partners and representatives namely, DMI, media partner, and Dubai Islamic Humanitarian Foundation, Inc. Naboodah cars. The first session focused on the first axis of the Forum, a legislative axis that includes the assets of the economy in Islam. Managed by scientist Prof. Dr. Muhammad Abdul Rahim Sultan, Professor of Jurisprudence and the UAE University, the session has been reviewed by four researchers within this axis. The first of research by Dr. Mutlaq Jasser brings the origin the Islamic economy and the pillars. The second research by Professor Dr. Shawki Dunia, brings the problems faced by the economy, relative scarcity, divergent needs and limited resources. This research is impartial to the demand and supple needs in the economy. As for the third paper presented by Dr. Hayel Abdul Mawla Tashtoush, the research shed light on the economic problem between characterization and solution of an Islamic economic perspective. Dr. Abdullah Mohammed al-Shami’s research titled, ‘Economy and Islamic Finance’ addressed alternatives to the global economic crisis, and highlights the causes of the economic recession that hit the world in 2008. The research also brings solutions inspired by the Islamic Law. The second session was held under the leadership of Prof. Dr. Jassim Ali Salem Al Shamsi, former Dean of the Faculty of Law at the UAE University. The audience listened to the research presented by Dr. Abdasameea Al Anis, who talked about financing instruments and its equality in the Hadith Al Nabawi. Dr. Abdul Karim Ahmed Kunduz presented an extensive economic reading of the ‘Revelation Sharia Research’ to address Islamic finance, while Sheikh Shah Jahan Niqab exhibited his research of the assets of Islamic economics between businesses. He stressed the depth of Islamic law in the economic field and the need to activate them. Dr. Asmaa Fathi Abdulaziz concluded her session with her research on investment controls and money spends in Islamic law. She explained the flexibility, which is included in Sharia, in terms of the diversity of investment channels. Once opened for discussion, the corridors of the meetings witnessed a great reaction from the audience. Appropriate and relatable topics with the desire to learn more about Islamic economic transactions overwhelmed the speakers. The activities of the Islamic jurisprudence forum will last up to 24th of March.